Last week I bought a Canonflex RP for $20 from someone whose father worked as a photojournalist back in the nineteen-sixties and carried this camera around everywhere he went in search of news stories. It had an action-packed life, recorded many interesting events and collected some bruises and dents along the way. There came the time, however, when it was no longer needed and so got demoted to the back of the shed abandoned and forgotten for several decades. By the time I got it, the still remaining leather curled up and hardened. The light seals turned to dust and the viewfinder was dim. The focusing ring on the lens barely moved. But it seemed, that it still had a spark of life in it, so I decided to give it a try and restore as much of its former glory as possible. 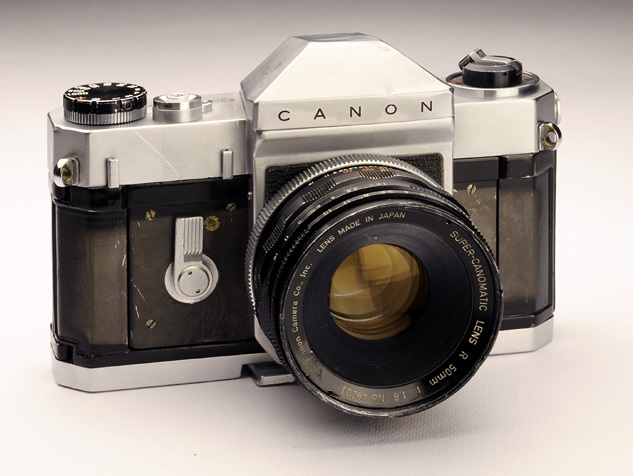 My mission was also fuelled by the fact, that this was a fairly rare Canon camera - according to some records, only 31,000 were made. Also, it is a nice camera to use and - as I realised when I worked on it - a camera repairman's delight. Simple, yet well made. Everything in it seems to be in the right place. (Despite of the unusual placement of the wind lever - I actually like it there.) Certainly, the lack of a light meter helped the designers to restrain the complexity. All in all, it is an excellent camera to learn on. I will not go into too much detail describing this, because when you start working on this camera, everything will be so obvious. The parts almost call out: "now undo this screw here and remove me next". There aren't any catches, either. Nevertheless, here are some pointers. Next comes the shutter speed dial. Find the three set screws on the side of it and loosen them. The dial just lifts off. Take out the flash connector socket. Don't try to rotate the outside ring. You need to unscrew the copper bit. It has two notches. Use the right tool for this (e.g. spanner wrench with pointy tips). All that remains now is to remove the two small screws at the back near the viewfinder and another one on the top near the shutter speed dial. (This screw was missing from my camera, so you won't find it on the picture.) The top should now come off. Warning: some of the rings - including the frame counter disk - around the rewind shaft come loose when the top is removed. Use the picture above as a guide to put them in order, if they get mixed up. Chances are that in an old, neglected camera the pentaprism and focusing screen need cleaning. On the Canonflex RP these are very nicely housed in a unit that can be separated from the body by undoing only four screws. After this, you also get access to the mirror to blow off any dust that might be present. The prism itself can be taken out after removing the inverted V-shaped plate that holds it down. Note also, that there are two plates on the sides which give it a more secure hold and protection. To take out the focusing screen, unscrew the four larger screws. Now, if you want to get yourself into some trouble, you can go further and undo the smaller screws, as well. This enables you to completely separate the glass from the metal frame. The focusing screen actually consists of two pieces; a magnifying glass and a fresnel lens. This latter is made of plastic and very delicate. It is impossible to clean it well. Even in the tidiest room there is always enough dust around to contaminate it. Just as soon as you though you managed to get all the dust off, there lands another speck on it. And, if dirt gets between the fine grooves of the fresnel lens, don't even think about wiping or washing it off. You could make a real mess of it. You might be luckier with the other, frosted side, but be very gentle there, as well. Any imperfection (including scratches, bright spots, water residue) are, of course, magnified in the viewfinder. Reassembly is also difficult, unless you were born with a third hand. You don't want to find out what I mean by this. Anyway, enough said. The lens on my camera was sitting loose in its mount. I didn't see it first, but the bayonet ring was a little bit out of shape and not attached tightly. So, I removed the front cover by unscrewing two small screws from the sides and one from the bottom. Underneath, the bayonet ring was held by four screws that needed tightening. At this point we can stop, lay back and have a well earned rest before we move on to the next step. Because, what I'm suggesting to do next, is to spend a good hour or so on studying the mechanism. I found it fascinating and I think I learned a great deal. See, if you can understand how the iris of the lens is wound up and what makes the aperture blades close down when the shutter is fired. 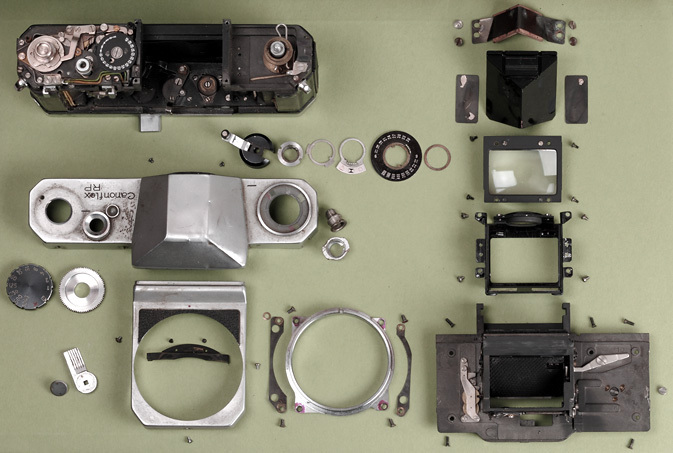 Can you figure out how the shutter works? (It is a little bit difficult when the front and body are separated, because half of the action takes place in one and half in the other, but don't shy away from the challenge.) Hints: After winding up, the sequence of events starts with the silver lever which is on the back side of the camera front. You can see it at the bottom right corner on the picture above. 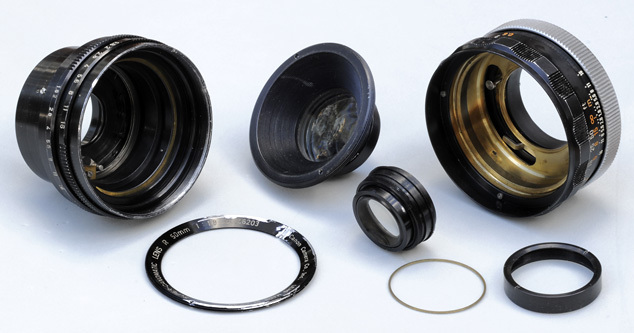 The complete cycle can be seen as consisting of three parts: 1) the shutter is wound up, 2) the shutter release button is pressed, aperture blades close down, mirror goes up, 3) shutter curtains run off, mirror goes down, aperture blades open. (Do you see, how the shutter is actually triggered by the mirror?) To release the shutter when the mirror assembly is not in the body, find a little pin at the top of the shutter curtain roller and pull it forward. Sometimes the delay action unit needs a good rinse in lighter fluid. It can be easily taken out by unscrewing two screws. One near the top, the other near the bottom of the assembly. They sit deeper down than the rest of the screws you see around there. There is little reason to disassemble the clockwork - it cleans well without it. Important: before putting back the camera front, wind up the self-timer. The camera cannot be properly assembled, if the self-timer is fully run down. 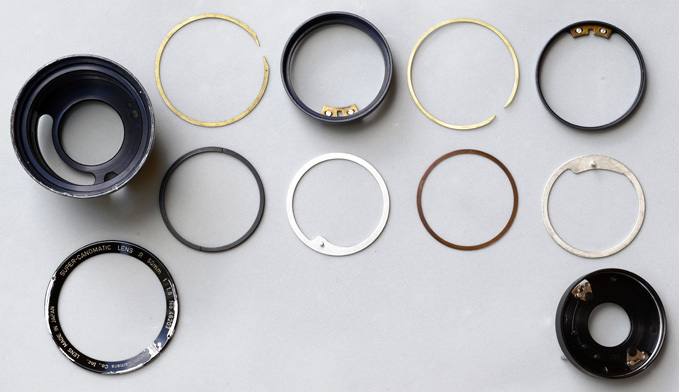 To slip off the aperture stop-down ring, you first need to remove some screws to clear the way and a large copper O-ring. It'll be self explanatory, so I won't detail it further. For the removal of the aperture setting ring, there is a little trick. You need to remove the little copper plate that has a tiny steel ball under it for the click stops. By doing this, you get access to three screws which secure the brass ring underneath to the barrel. Find and unscrew those screws and then the rings will slip off. On my lens, I found all sorts of things under these rings. Sand, mould, dead insects, and even green algae. This latter was the hardest to clean off. It stubbornly stuck to everything. Even when the part finally looked clean, the tissue paper I rubbed it in still showed a greenish tint. To get to the aperture blades, the bits inside the barrel will have to be removed one-by-one. This is not hard, but make sure you note the order and position of the parts. Best to draw a diagram, or - if that's too much of a challenge - take detailed notes. To be able to remove the last component (the one with the aperture blades), three set screws have to be loosened from the outside. Note also, that the marks left by these set screws will be your guide in correctly positioning this unit when re-assembling. I actually went as far as getting all the aperture blades out, so I could clean them properly. It is sooo much fun to put them back together! NOT. One last thing I wanted to mention: There is a round eye piece over the viewfinder window, which looks rather like an optional diopter correction lens. It is not. It is actually an integral part of the viewfinder and without it the image won't focus properly. So, don't discard it or replace it with something else.